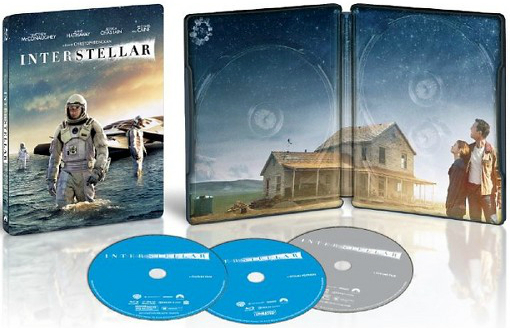 As befitting its blockbuster status, Christopher Nolan’s space travel opus ‘Interstellar’ will hit Blu-ray next month in several deluxe packaging options, including at least two different SteelBook cases. Although I’m a big SteelBook collector, in this instance I may choose a different route. While the American and Canadian SteelBooks technically use different images, they’re both based on versions of the movie’s kind-of boring poster art and work with a similar theme (i.e. 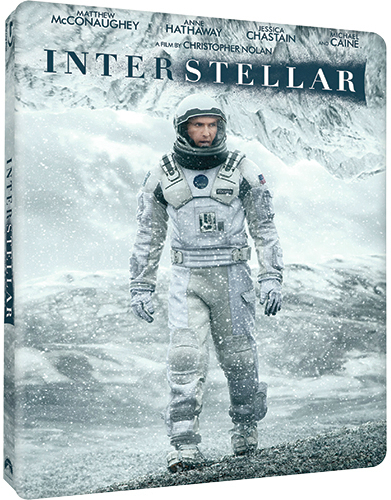 Matthew McConaughey in a spacesuit walking on indistinct terrain). Of the two, I would prefer the Future Shop case if it weren’t the exact same artwork that will be seen on the standard keepcase Blu-ray release. Even if not for that, I’m not really thrilled with it. The Target case, meanwhile, has a really ugly Photoshopped design that I don’t care for at all. Better than either of those is the much sleeker, more evocative artwork shared by the Walmart NEO Pack and the UK Digibook. For those of you unfamiliar with NEO Pack, it’s sort of a cross between a SteelBook and a fold-out digipak, and is the same type of case used in Warner’s “Diamond Luxe” line of discs. I think they’re very nice, and I favor that case out of these four options. 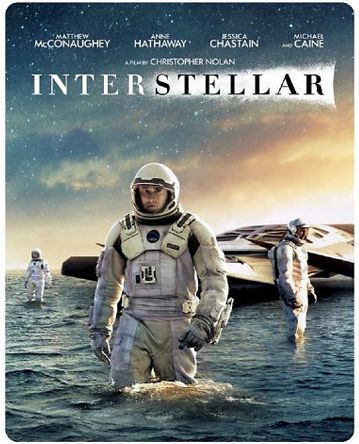 One thing that bugs me about all of them, however, is the way that the font used for the title highlights the “stellar” part of “Interstellar,” as if to subliminally suggest that this is a really stellar movie. I still haven’t seen it yet, so I’m not passing any judgments on that, but I find the cheap design trick really annoying. To my knowledge, all Blu-ray copies of the movie will be presented in the gimmicky alternating aspect ratio format per director Nolan’s preference. I’m not too thrilled about that part, personally. I’m considering the WalMart version…I like the packaging and getting a film cell. Yeah I think I’ll end up grabbing the Wal-Mart version as well. The cover art of the spaceship is far more compelling than McConaghey’s awkward space-suit pose. Plus the film cell thingy is a bonus. Is this the regular theatrical edition or will it have the extra 12 minutes shown in the recent theatrical re-release? I haven’t seen anything advertising the Blu-ray as an extended cut. My assumption is that it will be the original version, with a double-dip planned for later. If I’m not mistaken, those theatrically released 12 minutes are behind-the-scenes, eh, scenes. No footage was added to the movie. 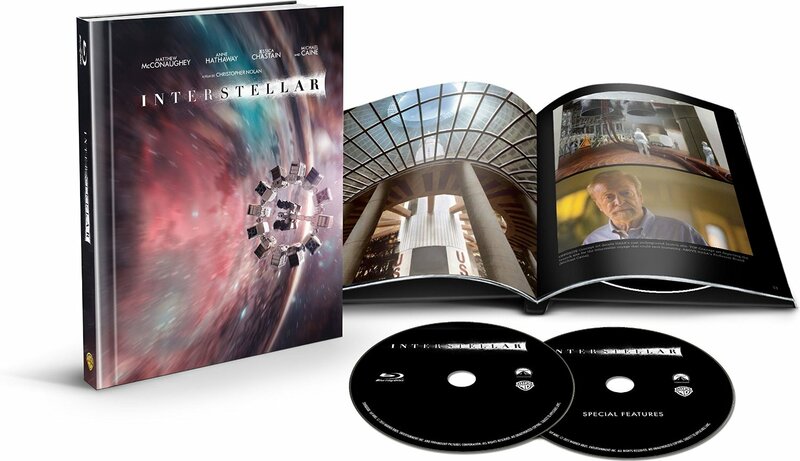 So the 12 minutes will undoubtedly be featured in the bonus material on the standard (non-double dip) Blu-ray. I know that Best Buy’s release comes with an additional special feature. Maybe that’s it. The extra 12 minutes wasn’t new footage. It was a 12-minute making-of featurette, which I imagine is part of the special features on any release. Well, I guess I will be canceling my Amazon pre-order. I am actually shocked that Zavvi has not announced a steelbook yet, but I am willing to bet that is only a matter of time. I like the FutureShop version the best, but since I am not Canadian….. The UK art is the same as the Canadian Steelbook, so I would expect to see an announcement eventually for a UK steelbook with the same cover art. Zavvi usually announces Steelbooks just a couple of weeks out from the release, so the fact that there is nothing on their site yet doesn’t surprise me. I read (somewhere) that all copies that go out on street date will include the 70 mm IMAX film cell – not just Walmart’s version. Has anyone else read that somewhere? Several countries will be getting the Steelbook that Target is getting. Of course that means if I want the Steelbook I may have to import it as finding one undamaged at Target will be next to impossible. Warning. Future Shop will not be shipping anywhere. Their owner, US Best Buy, shut the whole chain down on Saturday.